S-Voice, an app that comes with your Samsung Galaxy S 5, can handle some basic functions on your phone, including making a phone call, sending an e-mail or a text, searching the Internet, or even updating your Facebook status. You may love this capability, or you may find it to be a gimmick and not very useful. Either way, you can have some fun with this. 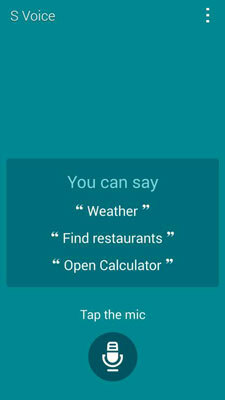 To get started, all you need to do is tap the S-Voice icon. This brings up basic S-Voice screen. Now ask for what you want. Say you want to call someone. Be ready. In just a moment, it calls Bill. It’s that easy. However, if you know several people named Bill, your phone asks you (in a pleasant female voice) which “Bill” you want to call. To send a text, say the words, “Send a text.” Done. S-Voice asks you, “Who would you like to message?” Give them the name. It looks up their number from your contact list. It then asks you for your message. Go ahead and say what you would have typed. S-Voice then converts your words into a message. These functions so far are pretty darn cool, but they get better. S-Voice has the ability to do some research on your behalf. 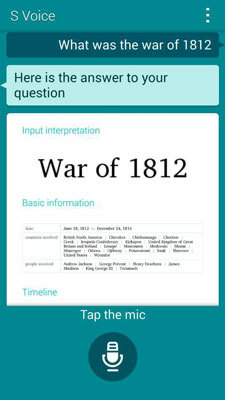 For example, say that you have a research project, and want to know, “When was the War of 1812?” Ask S-Voice. It comes back with the answer.